Greek revenues from tourism have increased more than 25 percent during the first four months of 2014, compared to last year. Both tourist arrivals and revenues are estimated to skyrocket this year in Greece. According to data released by the Association of Hellenic Tourism Enterprises SETE, in 2013 the average amount spent per visit was 660 euros. This year the correspondent number is expected to exceed 700 euros. Arrivals are expected to jump to 19 million, or 21,2 million including cruise visitors. SETE also stated that Greek tourism revenues are expected to rise from 12.2 billion in 2013 to 13.5 billion euros in 2014. According to figures released by the Bank of Greece on Monday, tourist arrivals from January to April 2014 have followed an upward trend of 21.1 percent compared to the same months of 2013, exceeding 1.9 million visitors. Only in April, the number of tourists arriving in Greece increased to 728,000, namely a 30.6 percent increase compared to April 2014. 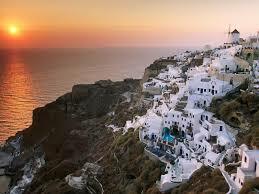 Tourism is expected to give an important boost to Greek economy since it is one of its main cash earners. This year’s revenues, from January until April 2014, have shown an amazing increase of 27.8 percent, reaching up to 900.2 million euros. More specifically, in April 411.1 million euros were earned by tourism, indicating an astonishing 35.8 percent increase compared to April 2013. Data released by the Bank of Greece prove that the increase both in tourist arrivals and spending per trip are the reason for the tourism receipts increase. Average spending per trip has increased by 6.2 percent compared to 2013. The biggest increase, however, is observed on Britons holidays’ giveaway, since they have spent 50.5 percent more during their visits in January-April 2014 than during the correspondent months in 2013. The number of cruise ship visitors is expected to remain approximately the same as in 2013, since financial crisis related turmoil has led cruise companies to show a preference towards the U.S. and other travel destinations rather that Europe and the Mediterranean. Buy2Greece.com – AEGEAN was bestowed the Corporate Social Responsibility Award for 2014 by the Athens Chamber of Commerce and Industry (ACCI) as part of the “2014 ACCI Awards” to enterprises and entrepreneurs. AEGEAN, winner of the Best Regional Airline in Europe Award, was bestowed this particularly important distinction in recognition of its strategic decision to systematically invest in Corporate Responsibility. In this context, the company implemented again this year a series of actions aimed at highlighting Greece’s cultural heritage, developing tourism, supporting education, promoting and reinforcing sports, adopting eco-friendly practices, and supporting vulnerable groups in society. The award ceremony was held on Monday June 23rd, at the Athens Concert Hall, before representatives of the worlds of business and politics. The awards were presented by Mr. Nikos Dendias, Minister of Development and Competitiveness, and Mr. Konstantinos Michalos, Chairman of ACCI. Greece is the most popular tourist destination among Austrians this summer, Austrian paper Der Standard wrote in its weekend edition, citing data by domestic travel groups. According to the biggest Austrian travel agency Verkehrsburo, Greece ranks first (15 percent) among the top destinations for Austrians this summer, followed by Turkey (12.7 percent), Spain (12.1 percent), Italy (7.9 percent), the United States (5.9 percent) and Croatia (3.4 percent). Regarding bookings, Greece has recorded a double digit rise of 12.3 percent, with Croatia coming in second with a 2.4 percent increase. More than 400,000 Austrians on average visit Greece every year. Les médias grecs ont fait un bilan de la visite de trois jours du Premier ministre chinois Li Keqiang en Grèce, qui s’est terminée samedi, indiquant qu’elle a renforcé la coopération mutuellement bénéfique entre les deux pays. Un article intitulé “Beijing émet un vote de confiance à la Grèce” paru sur le site d’actualités http://www.real.gr indique que la visite de M. Li a jeté les bases de la coopération Grèce-Chine à long terme qui apportera d’importants investissements chinois à la Grèce. “L’ordre du jour de M. Li a démontré l’intérêt de la Chine en matière d’investissement”. “Au cours de toutes les réunions et rencontres, le Premier ministre grec et son homologue chinois ont envoyé plusieurs messages afin de renforcer la coopération Grèce-Chine, dont les deux économies bénéficieront”, selon l’article. Un autre article intitulé “La Grèce peut devenir le lien stratégique dans l’entrée de la Chine en Europe”, a été publié sur le site d’actualités financières http://www.briefingnews.gr. “Les responsables grecs ne cachent pas leur satisfaction face aux résultats de la visite du Premier ministre chinois dans notre pays”, indique l’article. “La Chine souhaite non seulement renforcer ses relations avec la Grèce pour le bénéfice mutuel de nos deux pays, mais également renforcer sa présence économique en Europe via le lien grec. Les bénéfices pour la Grèce sont évidents”, souligne l’article. “Le plus important a été la déclaration de M. Li selon laquelle la Chine soutiendra les obligations européennes, particulièrement les obligations nationales grecques. C’est l’arme la plus puissante de la Chine dans son effort visant à renforcer son accès financier à l’Union européenne”, indique l’article. La Grèce était la deuxième étape de la tournée de M. Li dans deux pays européens, qui l’a également conduit au Royaume-Uni. La tournée, la première effectuée par M. Li dans les deux pays en tant que Premier ministre chinois, a injecté une vigueur dans les relations et la coopération entre la Chine et les deux pays et avec l’Europe dans son ensemble. When he visited Europe this March, Chinese President Xi Jinping proposed to build partnerships for peace, growth, reform and civilization with the EU. Greece is one of China’s most sincere and trusted partners in the EU. Favorable conditions, including good timing, geographical convenience, good human relations, and good foundations are conducive to building the four partnerships between China and Greece. Good timing refers to the fact that China is now in an important period of driving reform to a deeper level and extending opening up; at the same time, Greece is at a critical stage of economic recovery. Regional and international situations are both undergoing complex and profound changes, and the China-EU relationship will prosper. The two countries, with thousands of years of civilization, have become companions of destiny for the first time, with their futures closely linked to each other. Geographical convenience refers to Greece’s geographical location. Greece is located at the crossroads of Europe, Western Asia, and Africa, enjoying unique geographical advantages and good sea and air transport infrastructure and networks. The country can play an important role in building the Silk Road Economic Belt and the Maritime Silk Road. Good human relations refers to the fact that people in the two countries have mutual appreciation for each other’s culture, and share a profound traditional friendship. For example, a number of Greek ship owners overcame numerous obstacles to transport strategic materials to the new China in the 1950s, and many young Chinese couples choose to spend their honeymoons in Greece. The concept of mutual respect, mutual support, and mutual assistance between the two countries is deeply rooted in their society. Good foundations refers to the fact that the investment made by China Ocean Shipping (Group) Company (COSCO) in the Container Terminal of Piraeus Port, the largest Greek seaport, has been successful in promoting the local economy and employment. It has created a harmonious multinational business mode which can be regarded as a role model for China-EU cooperation. The positive development of COSCO Group in Piraeus Port has opened up broader prospects for China and Greece, and for China and the EU, to engage in further large-scale investment and trade cooperation in the future. We believe that China and Greece will be good partners for peace, growth, reform, and civilization. Together, the two countries will achieve common development and revitalization, and further contribute to human progress. China’ biggest private conglomerate Fosun Group signed an agreement in Greece on Thursday to invest $200 million to develop an old airport in Athens, marking another step in the company’s expansion in Europe. The agreement was signed with Latsis Group, the parent company of real estate firm Lamda Development, at a ceremony in the Zappeion Hall during the visit of Chinese Premier Li Keqiang to the Mediterranean country.